Yet another question....I'm putting pictures of the roof on so you can see what kind of roof I have. It's not rubber pretty sure. So anyway, I'm going to go over the roof and seal any cracks down to the tiniest crack. So my question is if you can tell from the pics what kind of roof do I have and what are your favorite sealers? I was thinking of doing a 2 hit by getting a spray and using that first and then a self leveling caulk. What do you think? The roof looks like it has been taken very good care of also. Let me know if the pictures didn't work. Thanks! That is for sure a metal roof. Aluminum material with seams at certain panel sections. I have not done the seamed type of roof yet. But have done an all one piece aluminum roof on a Coachman TT. I think Sunline Fan on the forum knows of a Heig's product to use on the seams. The seams joins each panel to make the roof longer and cover the whole roof. You paint it on the seams. There is a product called Eternabond Roof Seal, it is a tape you can put over the seams. It is made in various widths that will work on the seams and bond to aluminum, however the cost is most likely more. For a 4" wide tape it comes tan or white. Amazon also sells it if you have Prime the shipping may be cheaper. You really do not have to coat the entire roof, the seams and any penetration for pipes , roof vents, screw holes etc. yes they need treatments. On the caulking, do not use any silicone caulking on the roof. It is not the right product to last a long time. Dicor self leveling (501 series) roof sealant on horizontal surfaces or non leveling (551 series) on vertical surfaces will bond to aluminum well and is made to flex with the camper movement and not let go like silicone does. For any of the sealants you use, the roof must be cleaned to get any dirt, grime, loose and crusty old sealants off first. The prep work is critical. If there are old bad sealants and some may have used silicone before, that should be removed first. It can be painful to get all that old stuff off but putting good caulk over a bad underlayment is not a long term solution. A heat gun can soften up some of the older bad caulk to make scraping it up easier. Also, your roof is not a direct walk on roof in case you didn't know that. You need to use mangable sized sheets of plywood over the rafters to spread the weight out. I use a size that is about 24" x 48" x 3/8 to 1/2" thick. I can get them up there and down easy enough with that size. And you need a really good step ladder on a solid surface to get on and off. Take care when getting on and off the roof as the ladder can kick out. Use the 3 point contact method all the time getting on and off the ladder. 2 hands 1 foot, 2 feet 1 hand etc in contact with roof or ladder. 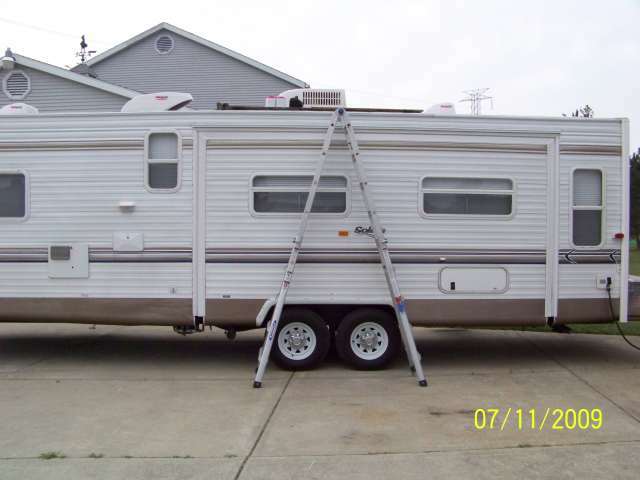 And keep you body weight towards the camper, not the outside of the ladder when transitioning between ladder and roof. See here. 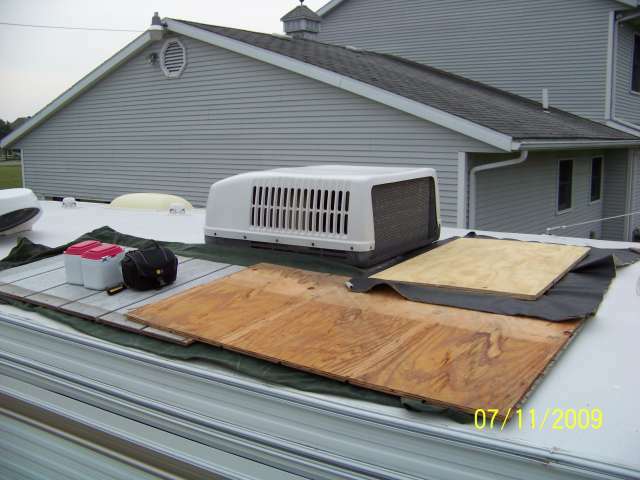 This is a rubber roof but same concept of the plywood support. I use a tarp under the plywood to not scratch the rubber. I also use it on the metal roof I did to not scratch it either. Thanks again JohnB! As for the plywood I thought I had to use wood that would go all the way across from side to side but this works better. I think I have a piece of plywood about this size. Hi team, is the link above, from Sunline fan, a good product for the roof of my 1850. The trailer roof took a beating this winter, but held up. I went over the seams a few years ago and need to repeat. Thanks. I did that treatment a few years ago as well on my T1350. I went to Home Depot or Lowes and bought a sealant tube or two that was suitable for aluminum sheeting. Obviously cleaned the cracks (seams) of dirt, debris and crumbs, not to mention any pine needle sap that could accumulate. BTW hot water is good to help rid the sap as it melts it. Then I sealed each joint and let it cure as written on the tube.